Maidenhead to Marlow - £10 | Marlow to Heathrow - Only £35. Book Now ! 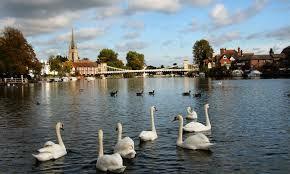 Heathrow Airport to Marlow Taxi Service is provided by A1 Taxis Maidenhead. We offer a transfer service from Marlow to any U.K Airport. If you are traveling to or from Heathrow Airport please go to the bookings page for an instant quote. All our bookings are pre booked so you can rest assured we will be there to meet you or take you to your destination. The town has many places of interest and attractions to offer visitors and tourists, the surroundings offer scenic views of the River Thames and the countryside of Buckinghamshire. Some day trips available for visitors include Salters Steamers, Stanley Spencer Gallery, Cliveden House, Odds Farm and The Hell Fire Caves. There are some beautiful manor houses in the surrounding areas to visit such as Windsor Castle.